Package prices are available for weekend campers. Fly the Airlines: If you plan to fly to Oshkosh on a commercial airline, you'll probably fly into Appleton, Green Bay or Milwaukee and rent a car.Appleton -- Outagamie County Regional Airport (ATW): Serviced by Allegiant, Comair and United Express. 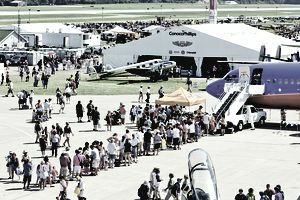 Check out the information on the AirVenture website for the latest parking entrances and construction updates.The nice folks at EAA AirVenture have also created a RideShare website for those looking to carpool to Oshkosh together. You can search by city or by date of departure to hook up with fellow Oshkosh attendees for a ride. 2016 Parking rates are $10 per day or $60 per week. Pilots must be at the top of their game to fly into Wittman Regional Airport. In fact, those super-nice folks at EAA have created a 32-page booklet for pilots to study beforehand. This booklet contains the instructions and procedures for flying your aircraft into Oshkosh. Know what to expect. The airspace at Wittman Regional Airport is congested, to say the least. But it's organized congestion, and if you know what you're doing, you'll fit right in. Read the air traffic control methodology used for Oshkosh before you go, so you know what the controllers are thinking. Study the arrival and departure procedures ahead of time. There's nothing as stressful as flying an airplane into the world's busiest airport when you aren't sure where to go or what to do. Figure it out beforehand, and everyone will be happier. Study your aircraft-specific procedures. Some aircraft, such as ultralights and seaplanes, have separate procedures you'll need to be aware of. Don't forget to learn the emergency procedures! Event-specific emergency procedures have been put in place for the safety of everyone. It's your responsibility to know what they are. Emergencies happen, but the risks to everyone involved can be mitigated by following the instructions. Avoid congested times and for obvious reasons, avoid arriving during airshows. Plan your fuel reserve wisely. You may be in a holding pattern for a while, and you might be in a long taxi line (known to exceed 45 minutes on the ground). Want to fly in but don't have an airplane? The RideShare service provided on the EAA AirVenture website is for pilots, too. Hook up with someone else from your area that might be offering a seat in their plane. Or, if you have space on your airplane, offer it up to a fellow aviation peer and make a new friend! Lastly, don't forget about your special pilot offers. EAA partners with many of the local FBOs and service centers to offer discounts. Take advantage of them via the AirVenture website. Many people camp at Oshkosh, as it's the cheapest option. But there other options, including hotels/motels, specialty lodging, and local college dormitories. Availability goes quickly, so it's best to plan your Oshkosh trip well in advance. For those last-minute folks, camping sites are usually available. Camping is available under the wing of your airplane or at one of the other campsites on the event grounds. Water and electrical hookups are available, but sell out quickly. The campground has free Wi-Fi, a theater, showers, food services and general stores. Camp Scholler provides space for drive-up camping and allows visitors to bring pets. The camping rate is $27 per night and requires a 3-night minimum stay. Campsites with water and electrical hookups cost $65 per night. Hotels:Area hotels are abundant but can be pricey during AirVenture, and they fill up quickly. The bonus is that most provide a daily shuttle to the event. Don't worry -- anything you might forget at home can probably be purchased right there at Oshkosh. Concentrate on having fun, making friends and enjoying the enormous aviation world that is Oshkosh! How Does FIS-B (Flight Information System Broadcast) Work?